Wondering where and how to start with so many log piles waiting to be split in your backyard? Is your back aching just looking at it? Why go through the trouble of manually chopping logs when you have automatic log splitters to do it for you? Yes, all you need to do is press a switch, pull a lever and voila! your log is split! The dangerous and tiresome chore of log chopping is safely and quickly taken care of with a log splitter at home, without straining your back. It’s a worthy investment for someone who regularly burns wood at home and in restaurants and hotels. Unlike manual chopping with axes and chainsaws, log splitters split wood to your desired size. And as most log splitters split wood into two pieces, you can split much more wood using it than with an axe or maul. Read on to find out which are the best log splitters on the market. Each option has its own set of individual pros and cons. You have to choose one of the best log splitters for yourself based on the amount of log you have to split. Some efficiently split large diameter logs, some work better with smaller logs and while some cut through hundreds of logs per session (see the article about fast log splitters), others can split only a handful. As different log splitters have different sources of energy, you also have to choose based on your preferred source of power. If you are on a budget and need a splitter to cut small to medium size logs, manual log splitters offering up to 10 tons of manual splitting capacity should be enough for you. If you are looking for something to use indoors, then electric log splitters are a better choice with 4-7 tons of splitting capacity. Another option is to look at some log splitter plans and see if a DIY option would suit. The gas powered ones are better because you have heavy duty very hard log splitting capacity to the tune of 38 tons. As you can’t get all the features in a single model, you have to make your choice after a considerable amount of research and thought. 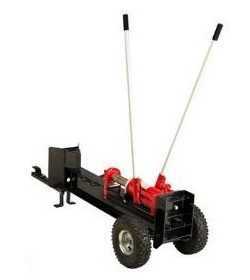 Manual log splitters are simple hand or foot powered devices. They are lightweight and easy to carry around, don’t’ need any electricity or gas and are perfect for splitting small volumes of logs. Though they do require some manpower to operate, it’s less than swinging axes and mauls and ideal for occasional and domestic wood burners. However, it’s not suggested if you have lots of wood to split as it’s time-consuming and needs lots of effort. Manual log splitters are budget-friendly when compared to other splitters. They offer up to 10 tons of splitting capacity and it’s 2-speed pump controls the lever speeds to provide the required amount of force. While low speed splits the grain, high speed follows through and completes the task. These are the most popular type of splitters with an electric motor powering the hydraulics better than gas engines. They are portable in size, lightweight and can be operated on ground level, on a bench or on a stand. These splitters offer the advantage of using both indoors in the basement garage, and outdoors including outdoor buildings, as it does not emit any harmful fumes when in use. All that the electric log splitters require is a standard grounded electrical 120V outlet where there’s no risk of the circuit bursting due to an overload. This type of log/wood splitter is popularly used in restaurants and hotels for making bonfires and fireplaces. It also requires less maintenance when compared to gas splitters as there’s no changing of fluids involved. It’s also affordably priced when compared to gas splitters. Its main disadvantage is that it’s rather noisy, especially if you plan to use it indoors. And of course, as it needs an electric outlet to work, you may not be able to use it if your work site doesn’t have one. These are the largest and most powerful commercial splitters with a maximum splitting capacity of 38 tons. They are fit for splitting knotty and larger diameter logs and as they don’t require any power outlet, they are more versatile in use. Most models come with trailer hitches for transporting from one place to another. These splitters are best used for splitting close grain woods like cherry and basswood. Gas splitters are, however, the most expensive and require regular maintenance like oil and air filter changes, spark plug replacements and fuel additions for optimal performance. They also have to be used with proper ventilation to avoid containment of the harsh fumes it produces, which is why they are not preferable for domestic and indoor use. These manual or electric splitters are generally smaller, cheaper and a better option for domestic use where the logs are horizontally loaded onto it. Horizontal log splitters are compact in size and better for homeowners who have to split light, small logs that are easily placed on the machine. They are used both indoors and outdoors, on the floor or at waist height with a stand which may come with the model or have to be bought separately. You will have to lift logs and place them on the machine if used on a stand. But of course, the stand can always be adjusted to your preferences and comfort. They are generally not as powerful as gas log splitters which makes them a better option for splitting low volumes of firewood to use for fireplaces, burners and stoves. They work best with small logs spanning 14” in diameter and 21” in length and ideal for splitting hundreds of logs a year. Vertical log splitters are best for splitting larger logs or larger volumes of logs, especially for commercial use. As it’s difficult lifting large logs or wood from large woodpiles into the machine, these splitters are designed to cut through logs while on the ground. This type of splitter is, therefore, better for larger logs that are difficult to lift off the ground or if lifting the logs onto the machine can lead to serious injuries. They are rather large in size and take up more storage space. They do, however, have sufficient power to cut through most wood types ranging from hardwood to freshly cut wood and most models offer the option of switching between vertical and horizontal splitting. But Which are the Best Log Splitters? Looking at all these types of log splitters, you naturally wonder what type and size log splitter do I need? And which are the best log splitters within each category? How old, dry, seasoned or unseasoned the wood is. The smaller, electrical horizontal log splitters are better for chopping small to medium volumes and small to medium-sized logs. They can be used at floor level or on a bench or may come with a stand for waist-high operation. The petrol-powered machines are the most powerful, ideal for people who regularly chop wood and need help easily handling all wood types. Some also offer added speed and efficiency, which may be a better option to save time. Stands – Useful for raising the log splitter from the floor and eliminate the need for bending to use it. Two-hand safety operation – Both hands are used for its safe operation. Wheels – Ranges from small, simple wheels to large all-terrain tires to store transport and split wood on the move. Transport handle – Helps wheel the log splitter from one working spot to another. Rubber or sponge ergonomic handles – Comes with some models which reduce vibrations while working for long periods for a more pleasant wood splitting experience. Height-adjustable log plate – A feature of vertical log splitters to deal with varied log sizes using two or three adjustable positions. Protected control levers – Provides extra safety to operate levers. Clamps – Holds logs securely in place while splitting and can be adjusted to fit different sized logs. Spring-loaded auto return – A rare but helpful feature that quickly returns the wedge to the starting position if you have lots of logs to split. Shaped log cradles – Popular with horizontal splitters in preventing logs from falling off while splitting wood. Warranty – A warranty of at least a year means the machine is a high quality one, where the manufacturers standby its performance. Brand -It’s better to buy quality brand products from brands like Powerhouse and Boss. Besides checking all these features, it’s always better to read a few log splitter reviews to find out what other customers have to say about the machines, and how they rate it. Highly rated units with positive customer reviews generally mean that the product is a high-quality one and a better purchase. The Boss Industrial ES7T20 7-ton electric log splitter comes from the Naperville, Illinois based Boss Industrial Company famous for producing well-designed and dependable wood splitters. 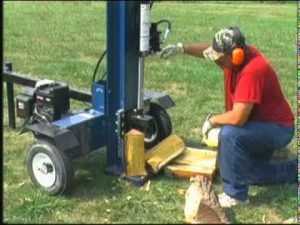 It’s the perfect wood splitter to make the jump from manual log splitters to an electric one. This is one of their best log splitters because of its functionality, superior hydraulics and well-thought features. It’s also on the CSA list, a famous and trusted testing agency ensuring its overall safety guarantee. It’s easy to use! Like most electric log splitters, the Boss ES7T20 is easy to use with one hand. Its 2 HP motor starts in a matter of seconds with the push of a button. It splits wood quickly, thanks to its cradle hydraulic system which has no complicated levers or buttons. This saves lots of time on big wood splitting jobs. It’s Compact in size! Despite its working prowess, the splitter is compact in size, to easily fit into your backyard or store in a cabin. Besides, the unit also has an automatic ram return feature. So there’s no need of resetting the unit for the next log. Perfect for domestic use It can apply up to 7 tons of pressure, which is good for an electric unit but less than gas models. With this force, it’s possible to handle lots of wood types found around your home or yard. And as its electric motor is rather quiet, it’s just right for domestic use. 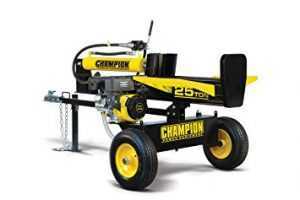 The Champion Compact Horizontal 7-ton Gas Log Splitter is designed for large wood cutting jobs. It’s powered by Champion’s reliable 80cc single-cylinder engine with a 0.4-gallon fuel tank and 0.4qt. oil capacity. Though small in size, the machine’s big in power. Quick 20-second full-time cycle The wood splitter is designed for portable, reliable and quick log splitting with its quick 20-second full-time cycle and auto-return valve. This is why the Champion wood splitter can perform a maximum of 180 cycles per hour. 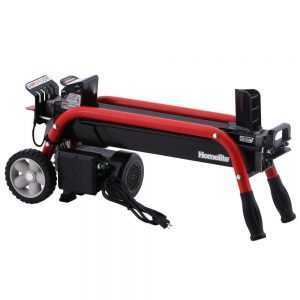 Low profile The unit easily handles logs up to 19.3 inches in length and 50 lbs. in weight, which its integrated log cradle safely keeps in position. With its low profile, you no longer have to struggle to lift large and heavy logs onto the splitter. Besides, its skewed wedge provides for improved splitting efficiency. Automatic low oil sensor With its automatic low oil shut-off sensor, it automatically switches off when there’s no oil. It is easily moved from one site to another with its convenient handle and all-terrain tires. It’s small and compact enough to fit into any truck-bed and to store anywhere. Its 2-stage gear pump adjusts flow and pressure for high flow/low pressure where there’s no resistance, and low flow/high pressure for increased productivity while cutting through logs. This is all backed by a 2-year limited warranty and an experienced network of technicians offering free lifetime technical support. If you prefer splitting wood the old fashioned way with your muscle power and a strong axe, then the Fiskars 36” X27 Super Splitting Axe may be what you are looking for! It’s sharp blade make splitting even medium and extra-large logs so easy. Practically unbreakable design The long handle makes the axe a good choice for taller users or anyone who prefers working with long axes. This is because the handle’s increased length creates maximum leverage, power and speed. The axe also boasts of a virtually unbreakable design with its stronger than steel FiberComp handles, and it’s indivisible insert-moulded PermaHead design. It’s perfect weight distribution and advanced blade geometry provides for maximum efficiency and a higher chance of one-strike splits with each swing made. In fact, each strike of the axe is as powerful as an aluminium baseball bat’s action where increased spring speed multiplies its power. Optimal blade design Fiskars is famous for its sharp-edged blades that are crafted using proprietary grinding techniques for better contact and cuts. The hardened forged steel blades remain sharp for a longer period of time. Its low-friction coating prevents the blade from getting stuck while splitting wood. Looking for wood splitting help? 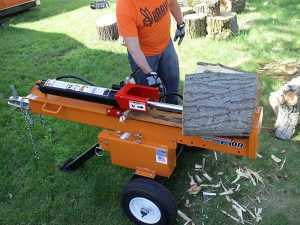 If yes, the Power Smart 6 ton PS90 Electric Log Splitter is a machine worth checking out. This is a wood splitter that helps quickly turn a pile of useless wood into useful firewood. It’s definitely much better and safer to use to split small to medium sized wood than a splitting axe. Its 6 ton RAM force makes splitting logs as long as 21 inches with a diameter of 10 inches so much easier. The framing supports logs properly because the machine has a tubing framing running along its sides providing the necessary support to prevent them from falling off while splitting. The tubing also reaches and wraps around the machine front to form a thickly padded handle offering a cool and comfortable grip. Though the PS90 weighs 101 lbs, it has much wider wheels than most machines of the same weight, this makes it very easy to transport! The wheels excellent treading also make it easy to transport around, even over bumps and uneven terrain. The splitter offers the added advantage of storing in a vertical position if necessary. Quickly splits wood The PowerSmart PS90 does have a rather long cycle time of 22 seconds, which cannot be set for a shorter time like some other units. However, it does ensure the splitter quickly resets in time to split another log. While the PS90 operates with a simple push button, electronic start, you do need two hands for its safe operation. It’s easy to use, stands solidly on the ground and is safe to use indoors like in a garage or barn. Kindling helps start a fire; and if you want to create kindling for your stove, campfire, pizza oven or fireplace without risking injuries, then the Kindling Cracker wood splitter is what you need. Built in Australia, this is a unique splitter because of its award-winning, patented design. Started as a science fair project It was created by a student for a science fair project, who wanted to make something to split firewood into kindling without any injuries, and has now gained international recognition. We believe that this is one of the best log splitters on the market, if not the best. Made in an Australian foundry, this is a single piece of high-quality iron which can last for generations if cared for and used properly. All it requires is an occasional brushing and a coat of paint to look new for years. No swinging of axes needed The Kindling Cracker consists of a cast-iron splitting head inside a 12” cast iron frame where the firewood to be cut is placed. A blunt instrument like a hammer, mallet or even another piece of wood or log is then used to strike and split the wood by driving it into the splitting wedge. So there’s no need for any electricity, gas or even swinging of any sharp axes to cut wood. As the Kindling Cracker makes splitting wood so easy, it’s a welcome addition to your woodworking arsenal. It helps make perfect kindling from your firewood to use for starting fires wherever required like for your pizza oven, smoker, barbecue, fire pit, fireplace or sauna. Now that you know quite a lot about log splitters, choosing one should not be that big a problem. You basically have to choose based on the amount of wood to be split, your budget, if you are doing it indoors or outdoors and it’s portability. After taking a look at the top 5 best log splitters on Amazon.com, the Kindling Cracker Wood Splitter seems to be one of the best log splitters, if not the best of the lot. It uses no electricity, fuel and very minimal effort on your part. It can be safely used indoors as it does not produce fumes to split regular sized 1ft long wood and lasts generations with minimal maintenance. Besides, it’s light enough to carry and use wherever you want, even to camping trips. What more would you need in one of the best log splitters on the market?